Available in 16 various colors. SKU: #WWP-400. 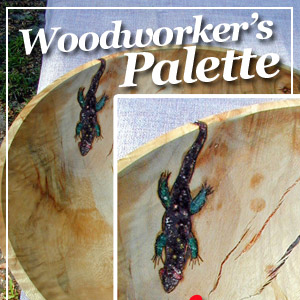 Category: Woodworker's Palette. This innovative new product is an easy to use filler for surface enhancement. It sands more easily than stone inlay and other non-wood fiber materials. endless options for not only filling cracks or voids, but to create designs as well. You are limited only by your imagination. It can help you salvage a bowl from the waste barrel by giving you an inexpensive option to repair and enhance a large crack or defect. You can use either Stick-Fast™ CA Glue or it can be mixed with Stick-Fast™ Epoxy for filling larger voids.